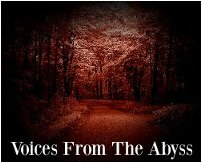 Voices From The Abyss is the ambient solo project of Simon Farrow. Growing up amongst the majestic splendour of Queenstown, New Zealand, Simon was from an early age interested in the sounds of nature that surrounded him. Later, after attending university, Simon became interested in sound design and specifically in ambient music. Voices From The Abyss is his first project dabbling in this musical genre, but it is certain not to be his last. Simon uses a variety of software to create his unusual sound sculptures and counts a vast number of ambient and electronic artists as his influences. Earth Mantra is happy to be bringing the music of this talented artist to our listeners and we hope to hear much more from him in the future.